IT was June, the height of the Nicaraguan rainy season, and the sky was thick with clouds. Our small boat cut south through the wind-churned Pacific, rounding one bend, then another. The looming hills were green with shrubby trees and coastal grasses; where they met the water, layers of rock folded like cake frosting into the ocean. Soon a wide bay opened up and the surf-and-sand boomtown of San Juan del Sur came into view. Structures lined the beach in Jolly Rancher shades: apple green, lemon yellow, watermelon pink. At the bay’s northern edge, large houses climbed a steep hillside toward a towering statue of Jesus. At the time — before the opening of the transcontinental railroad in 1869 and the Panama Canal in 1914 — this town on Nicaragua’s southwestern coast was the Pacific outlet for a major interoceanic route through the Americas. Arriving after nearly two weeks aboard a steamship, Twain first glimpsed Nicaragua’s coastline, whose “bright green hills never looked so welcome, so enchanting, so altogether lovely.” The next day, he and his fellow passengers were loaded onto wagons bound for Lake Nicaragua, 12 miles east. From there, they met another steamer, which ferried them across the 40-mile-wide lake to a stern-wheeler destined for the Caribbean. Twain, then 31, documented this journey in a series of letters to the Alta California newspaper in San Francisco that were posthumously published in 1940 as “Travels With Mr. Brown.” One hundred and forty-four years after Twain’s trip and a century after his death, I came to Nicaragua to retrace his journey. I started at sea, as Twain did — except I was on a “sunset booze cruise” operated by San Juan del Surf, a tour outfit whose main business is transporting surfers to hard-to-reach breaks. I was joined by a half-dozen other travelers and an expat couple. From the water, San Juan del Sur looked much the way Twain described it: “A few tumble-down frame shanties — they call them hotels — nestling among green verdure and overshadowed by picturesque little hills.” Once one of Nicaragua’s commercial ports, San Juan del Sur is a roughhewn town — the kind where a morning stroll might involve sidestepping a drunk sprawled on the sidewalk. Like the rest of Nicaragua, San Juan del Sur has teetered on the precipice of touristic stardom for years, but unreliable infrastructure and a lingering reputation for political unrest have kept it from making the leap. The arrival of the CBS reality show “Survivor,” which filmed the current season of its adventure spectacle nearby, has brought new hopes. I spent the day wandering San Juan’s narrow streets, taking in the tiled churches and Sandinista murals, and stopping for garlic shrimp at a thatch-roofed cafe. Later I followed the town’s palm-lined promenade and watched the boats, seagulls and stray dogs scavenging the beach. In Twain’s day, Nicaragua was being touted — by none other than the steamship entrepreneur Cornelius Vanderbilt, who had invested heavily there — as the next big thing. At the time, travelers crossing the United States faced a grueling wagon ride fraught with disease, accidents and bandit raids. On his 1866 trip back east, Twain opted for the Nicaragua route. Leaving San Juan del Sur by wagon train — “faded red ambulances” with “four little sore-backed rabbits hitched to it,” as Twain described them — it took Twain’s crew three and a half hours to reach Lake Nicaragua. I went by taxi — an aging Nissan Sentra, which I reserved through Casa Oro, a raucous hostel. My taxista, a young man with a penchant for texting while driving and little use for posted speed limits, had me there in 20 minutes. Soon after being deposited at the lake shore, I found myself balancing above the water on a narrow plank, halfway between a concrete jetty and the roof of a rickety wooden boat called the Mozorola. Lugging my suitcase behind me, I reached for the hand of the first passenger to offer one and was yanked aboard. The ferry, painted in blue, yellow and red stripes, required constant plunging of the bilge on our short trip to Ometepe, apparently to keep the vessel from sinking. 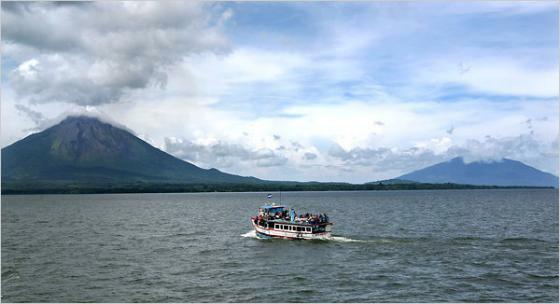 During Twain’s trip, the cross-lake steamer bypassed Ometepe entirely. Today, there is no direct crossing, which means a trip by water requires a stop on the island. I spent two days there stricken by a mysterious travel illness, so I never had a chance to explore the island’s monkey-filled rain forests or hike its volcanic peaks before catching El Rey de Cocibolca — the twice-weekly overnight ferry to San Carlos. I arrived at dawn, just as the sun was rising over the still, black San Juan River, and the town was already in full swing, buzzing with frenetic port town energy. There, I rented a small concrete room at a posada before grabbing breakfast and hopping another ferry. This time, it was a long, narrow, wood-hulled boat chugging east toward the Caribbean on the 118-mile river that draws the boundary between Nicaragua and Costa Rica to the south. The boat was overflowing with passengers, including a rooster, which periodically crowed from beneath its owner’s seat. Toward the bow, a group of men in baseball caps crowded around a portable radio, listening to a World Cup match. At one point the ferry slowed to a near stop, allowing a boat occupied by women in ruffled aprons to offer up sodas and chicharrones for sale. Traveling the full length of the San Juan River, from San Carlos to the river’s outlet near San Juan del Norte, can take 12 hours or more —roughly as long as it took in 1866. The year-round ferries leave only twice a week; along the way, they deposit riders at stilted homes carved out of the lush understory. In some ways, this corner of Nicaragua is more isolated now than it was in the 1800s, when thousands of travelers — Argonauts, adventurers and other opportunists of the American West — journeyed down the river as part of a cross-continental passage. Today, the eastern half of Nicaragua, much of it parkland, is so remote that many Nicaraguans have never seen the country’s Caribbean coast. Against this backdrop of what Twain called “wonderful waterfalls of green leaves as deftly overlapping each other as the scales of a fish,” I stayed the night perched over the river near the village of Boca de Sábalos, listening to rain pound the corrugated metal roof of my bamboo cabin, and woke with a scorpion in my bed. (The hotel owner quickly dispatched a gardener to kill it.) In nearby El Castillo, I ate lobster-sized river shrimp and watched giant tarpon surface like sea monsters beneath an old Spanish fortress in a town whose garbage truck is a horse-drawn wagon. Along the river, everything was alive. What looked like a piece of driftwood was an alligator on a rocky beach. The bumps on fallen branches turned out to be turtles. High in the wild almond trees were boisterous howler monkeys. But there has been death here, too. In Twain’s day, one of the world’s few species of freshwater sharks swam these waters. Now it is rare to see them; they are locally endangered. Entire towns have also been extinguished. Greytown, the once-bustling port village where the San Juan meets the Caribbean, and where Twain observed that “the transit business has made every other house a lodging camp, and you can get a good bed anywhere for a dollar,” surrendered long ago to the jungle’s relentless encroachment. Nicaragua doesn’t use standardized, numbered street addresses. Instead, directions are given from nearby landmarks. United States dollars are widely accepted. San Juan del Sur, Adelante Express (505-8850-6070; sanjuanvan.com) runs direct shuttles from Managua’s international airport. Ferries crossing Lake Nicaragua leave from both Granada and San Jorge. Schedules to San Carlos should be checked in advance. The fortress at El Castillo (follow the steps from the dock to the top of the hill) is a national historical site with an excellent museum. Open daily from 8 a.m. to 4 p.m. Admission, 67 cordobas (about $3.25 at 21 cordobas to the dollar), including a camera fee. The tourist office in San Carlos (one block south of the central park; riosanjuan@intur.gob.ni) provides information on transportation, tours and hotels. In Boca de Sábalos, Julio Murillo, an English-speaking guide (505-8431-2390), offers a range of river trips. Pelican Eyes Hotel & Resort (San Juan del Sur; 305-600-4426; pelicaneyesresort.com) offers ocean-view cabins, infinity pools and a fine restaurant. “Green Season” doubles from $180. On the fortress steps, Hotel Albergue El Castillo (above the dock, El Castillo; 505-8924 5608) is an airy wooden lodge with a wide porch overlooking the river. Doubles $15, including breakfast. El Pozo (20 yards south of the market, San Juan del Sur; 505-8937-4935) has a creative menu of international dishes, like tuna poke (150 cordobas) and pipían cakes (95 cordobas) made with local ingredients. The casual family-run restaurant Chinandegano (260 yards east of the dock, El Castillo), is the place to try giant river shrimp (250 cordobas) drowned in butter and garlic.